Convenience store chain 7-Eleven is offering free small Slurpees to commemorate its 86th birthday. Get your free Slurpee today! It's Free Slurpee Day for fans of the popular frozen drink. To mark 7-Eleven's 86th birthday, the convenience store chain is offering free small Slurpees Thursday from 11 a.m. to 7 p.m. at participating stores. That's a sizable cupgrade from the 7.11-oz. free drinks the stores usually give out in celebration -- nearly doubling the amount of frozen flavored slush, NBC DFW reported. 7-Eleven is also rolling out a host of other promotional items to mark the big day: a YouTube video introducing a "Slurpee dance," new Slurpee flavors, party favors, a mobile phone app, and Slurpee-branded merchandise. This summer's featured flavors include Slurpee Strawberry Lemonshade and Slurpee Lite Sugar-Free Mango Lemonade. 7-Eleven began in 1927 when a Southland Ice Company employee began to sell bread, milk and eggs on an ice dock in a Dallas suburb. From then on, the ice company blossomed into a major chain with over 10,000 stores nationwide and over 50,000 worldwide. 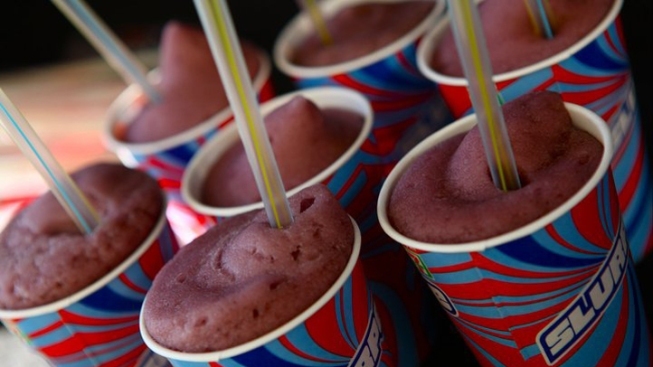 Free Slurpee Day first began when the convenience store chain celebrated its 75th birthday in 2002.